2006 promotional video of the Carolina Games Summit when it was named the Goldsboro Gaming Expo! A cool promotional video created by an attendee for our upcoming 2009 event! Super Smash Brothers Brawl Tournament 2009 Winners Bracket Finals! Just a taste of what our event was like. 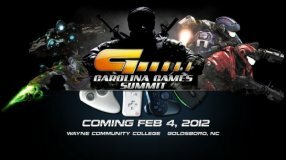 Over 1400 gamers in Goldsboro, NC one Saturday! Seann Romero from "Definitely Cooler" Travels to our 2009 event.